This show has been postponed due to the severe weather forecast. Rescheduled date will be announced soon. Towne Crier will be OPEN FOR DINNER ONLY this evening. 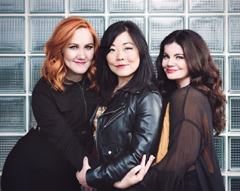 The members of Nobody's Girl – BettySoo, Grace Pettis, and Rebecca Loebe – hail from Texas, Alabama, and Georgia, respectively. Now neighbors in Austin, Nobody's Girl is bewitching audiences with sumptuous harmonies and unforgettable songwriting. Friends now for a decade, they first met at the legendary Kerrville Folk Festival, each winners of the annual “New Folk” award. Luscious harmony singers, effortless instrumentalists, seasoned touring artists – they recognized what each can accomplish individually could be made all the stronger by collaboration. Now, the spark has been set, the fire lit. Their individual and collective fans are eating it up.